They came to pay their last respects. 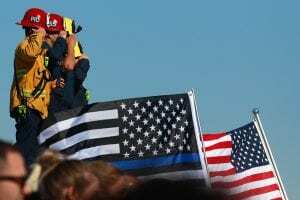 Law enforcement officers and first responders from across the Southland gathered in mourning along with hundreds of others on the streets near Los Robles Regional Medical Center in Thousand Oaks on Thursday. In stunned disbelief, they watched as a procession transported Sgt. Ron Helus—who died trying to stop the Nov. 7 mass shooting at T.O.’s Borderline Bar and Grill—from the hospital to the medical examiner’s office in Ventura. Sheriff’s spokesperson Capt. Garo Kuredjian said Helus, 54, was pronounced dead at the hospital in the early morning hours of Nov. 8. A California Highway Patrol officer and Helus, a Moorpark resident and a 29-year veteran of the Ventura County Sheriff’s Office, went into the popular nightclub on Rolling Oaks Drive after a man opened fire around 11:20 p.m. Wednesday. Helus didn’t survive. More than 50 cars and motorcycles led the procession that included a hearse carrying the body of Helus. He rested inside a casket draped by an American flag. Others waved flags, too, talking in small groups and trying to make sense of the tragedy. Among those watching the motorcade was Thousand Oaks resident Greg Paige, who said he wanted to show his appreciation for a man being hailed as hero in the line of fire. “It’s sad to see that this has happened again, but this time in our town. I’m showing my respect to Sgt. Helus,” Paige said. Jen Manory, who lives in Simi Valley but works in Thousand Oaks, said her 19-year-old daughter, Hunter, was invited to Borderline last night but couldn’t go because of a hair appointment. Manory said her daughter’s friends left the bar at 11:10 p.m., mere minutes before the gunman opened fire. “It’s awful. When I was growing up, we never had anything like this. You’re just not safe anywhere,” Manory said. Some at the procession searched for a light in the darkness. In the wake of the shooting, Rabbi Chaim Bryski of Chabad of Thousand Oaks, who volunteers as a chaplain at Los Robles, encouraged people to mend personal relationships and to do their part in making the world a better place to live. “Add a little more light, a little more closeness today,” Bryski said. 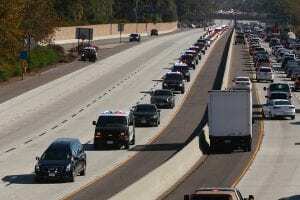 The motorcade heads north on the 101 Freeway past Borchard Road.